Redefining the role of retail in regeneration policy is now a key challenge for planners in the UK. Above: The Oracle, Reading UK. One of the UK’s most successful regeneration projects – based on shopping, but what happens next? Much of the urban re-generation through the 1990s and the first decade of the new century focused on the importance of the city centre(1). UK projects drew from European success stories: Barcelona, Berlin, Bilbao and applied it to our new public spaces. Planning criteria drawn up under John Prescott during the first term of 1997-2010 Labour Government acted as a constraint on the out-of-town mall and sprawling retail parks as the first priority for retail chains. The rules didn’t halt out of town development but it did push the balance back toward the urban centre. Had this been a matter of solely planning intent it would have been doomed from the outset. The market was on the side of the planner. Affluence, increasing disposable income and cultural changes created in the UK a much expanded ‘after hours’ economy which was to do with far more than mere alcohol consumption. Eating out in the UK had been something only the better off could do until the 1980s since when it has grown dramatically. The growth of dining out as much as anything else made city centre became a destination for the evening and created employment for an increasing pool of young part-time labour. Music, club culture and the resurgence of cinema all played their part in transforming the ‘closed after work’ UK city centre to an all day, all night economy. But whatever else was going on in city centre regeneration retail was always the magnet. In the UK we like our retail. Enough urban planners and politicians grasped the notion that ‘going to the shops’ was and is a major part of the lives of many ordinary people, especially women. It was a constant, a given, aspirational consumerism that crossed class and culture. Through the past two decades we created a quality experience around it and our cities thrived. Whatever else might change people would always ‘go to the shops’, wouldn’t they? Well, no and it is having a significant effect in our cities. UK commentators have focused on the recession and falling consumer spending but more significant for the retail sector is the effect of web-based retail. Recent closures at Comet, Jessops and HMV have added to a range of familiar names that have been left behind by the shift to online spending. Retail staff report that ‘going to the shops’ has become a scouting mission – find the facts, touch the product, compare, contrast, get a little demonstration, then go home to order it online for a few quid less. Staff in fashion retail outlets report spending as much time dealing with internet returns as making sales. You don’t need to be chief economist at the IMF to work out the consequences. The trend won’t end with this recession either (whenever that may be). Recession confirms and accelerates market trends, rarely does it create them. 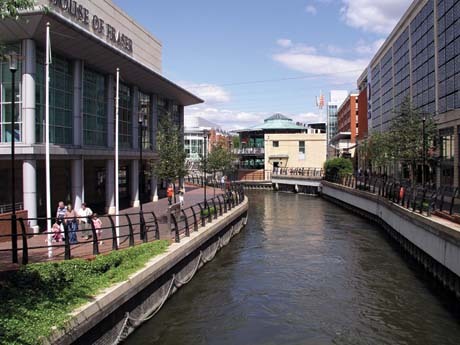 In Reading, one of the UK’s leading retail centres at a highly successful 90s city centre regeneration that has punched above its weight in the good times has seen a marked increase in vacant and available (on the market) retail space since 2009. If the magnet for the city centre economies is losing its pull, how do we maintain the health of our cities? How do major retailers respond to the challenge of web commerce? How do national governments and the EU deal with tax sheltering multi-nationals who undercut local trade and put nothing back into communities? What does it mean for property owners, investors and landlords when there is increasing vacancy in relatively new properties? And aside from the more obvious economic consequences, what does this say for the quality of leisure experience when diversity is sucked out of city centre commerce? What does it do to our social lives? Two experiences brought this home to me: going to a major department store to purchase a lamp advertised in their mailshot only to find stock levels were so poor we were told to order online; and seeking in vain a pair of boot laces (off and on trying around fifteen stores) only to resort to Amazon. If our city centres are not to enter a new period of crisis and decline creative thinking will be needed on many levels to adjust to these powerful market trends. 1) I am here using the term ‘city’ as the generic descriptor of substantial urban centres rather than anything determined by charters, cathedrals or historic significance. I realise some get their underwear is a knot about such matters – but please don’t call me about it. (2) Figures quoted from Reading UK CIC email update Feb 2013 sourced by Hicks Baker.